The former vice president writes in the New York Times that it would "be an enormous relief if the recent attacks on the science of global warming actually indicated that we do not face an unimaginable calamity requiring large-scale, preventive measures to protect human civilization as we know it." While it may be true that mistakes have been found in the thousands of pages published by the Intergovernmental Panel on Climate Change, the important fact is that "the overwhelming consensus on global warming remains unchanged." Plus, it's just as easy to argue that, in several instances, the panel's scientists have underestimated some of the damage. While it may be tempting to look at the cold winter in the United States and say that the concept of global warming is preposterous, across the globe it was the second-hottest January on record. And, in fact, scientists have long said that rising temperatures will lead to more rain and snow in several regions. "Just as it's important not to miss the forest for the trees, neither should we miss the climate for the snowstorm." Meanwhile, the world remains paralyzed. Some have attributed this to the cap-and-trade system, and are trying to come up with a different approach. The problem is that not only is there no "readily apparent alternative"; it would also be exceedingly difficult and time-consuming to convince the rest of the world that they should follow an entirely new approach. FT.com / Columnists / Christopher Caldwell - Is Google now a monopoly? Google has cast attempts to regulate it as assaults on fundamental freedoms. Its search engineer Amit Singhal asked on the company’s blog this week “whether regulators should look into dictating how search engines like Google conduct their ranking” and discussed the unfolding debate over “government-regulated search”. Terms like “dictating” and “government-regulated” reflect a certain US provinciality, a deafness to measures of corporate responsibility other than libertarianism. Recently, Google has been wrong-footed by Germans’ reluctance to have street-level photographs of their houses and yards posted on Google’s maps. This week, Google said it was “astonished” when an Italian court ruled against its executives for not taking down quickly enough a video of an autistic child being harassed by teenagers. The US ambassador to Italy defended Google by noting that secretary of state Hillary Clinton has said that “a free internet is an inalienable human right”. Such attitudes have the ring of 1990s web utopianism to them. They are in for a re-examination. So if the current model is broken, how can it be fixed? There are two broad answers: rules and tools. Rules would mean new regulations. And Congress and the Federal Trade Commission are looking at further rules that could limit how personal information is used. For example, the government might ban the use of recorded trails of a person’s Web-browsing behavior — so-called click streams — in employment or health insurance decisions. Still, the next round of online privacy regulation needs to proceed carefully, policy experts warn. They say that online data collection and analysis is an economic imperative, and that the Internet industry of the future will involve adding value to the free flow of information — much of it created by individuals and their browsing activity. Google, Facebook and Twitter are evidence of the trend, and so are legions of start-ups seeking riches in fields like social networking, cloud computing and smartphone applications. Google disclosed this week in its own blog posting that the European Commission had made preliminary inquiries about complaints against Google made by three European Internet sites. One was from a Microsoft subsidiary, Ciao.de. The others came from a British price comparison site, Foundem.co.uk, and a French search engine specializing in legal matters, EJustice.fr. The dueling blog posts are the latest sign that the fierce rivalry between the two companies is spilling into the public policy arena. Both companies are lobbying fiercely in Washington D.C. and Brussels to shape laws and regulation in their favor. For the first time since 1887, students at the University of Virginia won’t have a hardcover memento of their college years. The school founded by Thomas Jefferson has become the latest college to decide that there’s no place for the traditional yearbook in the age of Facebook. Student apathy and the financial realities of publishing makes the chance of reviving it slim, editor Michelle Burch said. However, fresh evidence emerged on Thursday that Google employees do sometimes override the system, at least when it comes to the automated process that determines the weighting given to search adverts in its Adwords system. At the first opportunity for audience participation just several minutes into the proceeding, a longtime and well-known Apple shareholder--some would say gadfly--who introduced himself as Sheldon, stood at the microphone and urged against Gore's re-election to the board. Gore "has become a laughingstock. The glaciers have not melted," Sheldon said, referring to Gore's views on global warming. "If his advice he gives to Apple is as faulty as his views on the environment then he doesn't need to be re-elected." A Microsoft spokesperson did not say why the company has reversed its stance. "Like all service providers, Microsoft must respond to lawful requests from law enforcement agencies to provide information related to criminal investigations," a Microsoft spokesperson had said in earlier a statement. "We take our responsibility to protect our customers privacy very seriously, so have specific guidelines that we use when responding to law enforcement requests. In this case, we did not ask that this site be taken down, only that Microsoft copyrighted content be removed. We are requesting to have the site restored and are no longer seeking the document's removal." Facebook this week was awarded a patent pertaining to streaming "feed" technology, more specifically "dynamically providing a news feed about a user of a social network," complementing another patent filing that has been published but not yet approved. The implications for this, as AllFacebook.com pointed out earlier on Thursday, are far-flung: Facebook may choose to pursue action against other social-media sites that potentially violate this patent. Twitter, as AllFacebook points out, is effectively one giant news feed, to the extent that it clearly has influenced some of the changes that Facebook made to its own feed technology. Facebook Inc. said a glitch with a software update caused some email messages to be sent to the wrong recipients for "a short time" late Wednesday, raising questions about privacy on the site. A Facebook spokeswoman said the company was still investigating the problem and didn't have specific data on the number of people affected by the glitch. The email glitch is the latest to cause concern about privacy on Facebook and other sites that allow people to share personal information over the Web. Palm Inc. bet its survival on a pair of new smart phones. Now, that wager is unraveling, and the company is partly blaming one of its wireless partners. The struggling handset maker said Thursday its flagship Pre and Pixi devices, which were launched last year, aren't selling as well as it hoped and warned revenue for the year ending in May will be "well below" its forecasts. Palm's shares plunged 19% to $6.53 on the disclosure, which renewed questions as to whether the company can compete in a market it helped pioneer. Botnets - networks of compromised computers controlled by hackers known as “bot-herders” - have become a serious problem in cyberspace. Their proliferation has led some to worry that the botnet problem is unsolvable. Under the control of a hacker or group of hackers, botnets are often used to conduct various attacks ranging from denial of service attacks on websites, to spamming, click fraud, and distribution of new forms of malicious software. Google Advertises Chrome … On Bing! It’s not unusual for other search engines like Yahoo, Bing or Ask to advertise on Google. But I’ve never seen Google run an ad on another search engine until now. Technology Review: Can Twitter Make Money? The change in Twitter's prompt reflects a shift in the nature of the Web itself. Not only has the medium grown far more social, but online social networks increasingly trade in important real-time information. Adding to the cacophony are proliferating blogs, reports from news organizations, reader comments, and feeds from various other sources. Data feeds, search engines like Google, and easy-to-use widgets--those little on-screen tools that do things like display stock prices or news headlines--can provide instant access to much of this information. "In 2009, we saw this incredible shift of users--and of their attention and focus--to the real-time Web," says John Borthwick, CEO of Betaworks, an Internet media company in New York City that has invested in or launched startups including Bit.ly, TweetDeck, and Summize, a Twitter search tool bought by Twitter in 2008. "It represents a whole new round of innovation, disrupting the way people do the fundamental things they do online." And, he adds, sites like Twitter and Facebook--which has 350 million account holders--are increasingly the first stop for people seeking real-time news. More on the Google European Commission context. BTW if the Google lawyer quoted below ran a few search queries, she’d find that Microsoft does indeed share its source code with key partners, governments, and others. However, Google executives said that any requirement to be more open about how the company’s systems worked would go beyond what European regulators have required in other cases and would be highly damaging. She also denied that Google deliberately relegated competitors to a lower position in its search rankings. “It would not make sense to marginalize Foundem but not Amazon – Amazon is a much bigger risk to us,” she said. The secretive nature of the algorithm is at the heart of the antitrust complaints the company faces in Brussels. Companies find it hard to understand why their rankings go up and down, and Google stands accused of manipulating the formula to discriminate against competitors. The complaints from the Foundem, ejustice.fr and Ciao websites, fall into two parts. One is to do with Google’s ranking system, with the three sites claiming they were penalised for being niche search services, competing with Google’s own search offerings. Google said the sites were ranked low because its algorithm is designed to weed out sites that are not useful for internet users. In Italy, where Prime Minister Silvio Berlusconi owns most private media and indirectly controls public media, there is a strong push to regulate the Internet more assertively than it is controlled elsewhere in Europe. Several measures are pending in Parliament here that seek to impose various controls on the Internet. Critics of Mr. Berlusconi say the measures go beyond routine copyright questions and are a way to stave off competition from the Web to public television stations and his own private channels — and to keep a tighter grip on public debate. Microsoft Corp. has won a court order aimed at taking down a global network of PCs that the company accuses of spreading spam and harmful computer code. A federal judge in Alexandria, Va., granted a request by Microsoft to deactivate 277 Internet addresses, or domain names, that the Redmond Wash., company links to a "botnet," an army of tens of thousands of PCs around the globe infected with malicious code that allows them to be harnessed for nefarious purposes. Registration records associated with the domain names all list contact information in China. The owners could not immediately be reached. The complaints were due to the fact that Cryptome published a 17-page Microsoft Global Criminal Spy Guide. Microsoft claimed copyright infringement; Cryptome's editor refused to budge; and the site was taken down this afternoon. Cryptome has previously published similar guides from Facebook, AOL, Yahoo and Skype; the site has been threatened but never before actually disabled. The Microsoft document was originally published on February 20. Microsoft demanded that Cryptome remove the PDF, and when the editor refused, Cryptome's ISP sent a warning: If the document was not removed by Thursday, the site would be disabled. However, the site was taken down Wednesday afternoon. And you should see how well Buzz works with Apple’s iPhone. Buzz uses the phone’s GPS system to identify your location and share it with other Buzzers, if you wish. Buzz from a favorite restaurant or retail store, or check out someone else’s buzz. Up pops a map, customer reviews, and other pages related to the location. Facebook has nothing like this. Still, Google crushed once-mighty Internet search rivals like Alta Vista and Yahoo because its product was far superior. Its social-networking service is good enough to survive and maybe even to thrive, but not good enough to conquer. Put it this way: Buzz may not be another Orkut, but it’s certainly not another Google. Today, at the eighth annual Microsoft U.S. Public Sector CIO Summit, Microsoft Corp. unveiled a number of new enhancements and certifications for the Microsoft Business Productivity Online Suite (BPOS) that continue to raise the bar in cloud security and privacy. In a keynote speech addressing more than 300 public sector CIOs, Ron Markezich, corporate vice president of Microsoft Online, launched an industry first — a new dedicated government cloud offering based on the BPOS. For education, Microsoft also announced it is extending identity federation services to Microsoft Live@edu to help schools improve collaboration and security, as well as simplify identity management and support interoperability among disparate software applications. Microsoft Unveils New Government Cloud Offerings at Eighth Annual Public Sector CIO Summit: Summit brings together government and education officials to examine advances in cloud computing, security, collaboration and citizen services. The announcement was celebrated by environmentalists, who have long pressed G.M. to simply kill the brand, which was born from military Humvees in 1992. G.M. acquired it in 1998. While we all know that some tidbits of information in the iPhone/iPad SDK don’t necessarily mean we’ll see these features soon (or ever) on the devices, they can be a good pointer as to what to expect from their future iterations. The folks at 9to5Mac and MacRumors have done some digging, and found references to front facing camera, zoom, flash and video conferencing in the latest Beta 3 iPad SDK. Xerox Corp. alleges in a lawsuit that Yahoo Inc., Google Inc. and Google's YouTube video site have infringed on the document and services company's patents on Internet search and e-commerce technology. The suit, filed Friday in U.S. District Court in Wilmington, Del., alleges that Google's AdSense and AdWords software—programs that serve up ads based on Web-site content and users' search requests—violate a Xerox patent on automatically generating queries. Google Inc. said European antitrust authorities have opened a preliminary inquiry into complaints about its tactics made by three European Internet companies. The inquiry, disclosed late Tuesday, appears to focus largely on complaints that Google unfairly ranks the sites of Internet competitors, in effect lowering their rank in search listings on Google sites. Google denied violating European law or taking any action to stifle competition. The European Commission inquiry is at an early, fact-finding stage and may not result in any action. But it appeared to be the first time that European antitrust authorities have examined Google's conduct outside of a merger review. Google called the decision "astonishing" and said it would appeal. "The judge has decided I'm primarily responsible for the actions of some teenagers who uploaded a reprehensible video to Google video," Google's global privacy counsel Peter Fleischer, who was convicted in absentia, said in a statement. The US government must take a more active role in securing the Internet, industry experts told Congress yesterday, arguing that the prospect of a serious attack is growing as businesses and governments rely more on cyberspace. Comparing the digital age to the dawn of automobiles, analysts said more regulations may be the only way to force the public and private sectors to counter cyber threats adequately. They compared the need for new oversight to regulations for seat belts and safety equipment that made US highways safer. The decision to close your Google account has to be carefully considered—after all, this is the place that stores your email, your documents, your contacts, your photos, your news, and even your health records. But this level of investment to one service is as good a reason to leave as it is to stay: If looking at your Google Dashboard, which lists all the services you use, and the amount and type of information you store on them, doesn't make you feel a little uneasy, then hell, what would? Anyway, I'm not here to make the case for you to drop Google altogether—it's not something I'm prepared to do, for a start—I'm just here to tell you how to do it. Here's everything you need to know about life after Google. Apple has owned the digital music market since it essentially created that market with the launch of the iTunes music store in 2003. Since then, the company’s one-two punch of iTunes and iPod has fended off all comers. But we’re approaching a major inflection point in the short history of digital music, a time when we stop administering our own music collections on local hard drives, and instead build them online, where they can be accessed on a multitude of connected devices — smartphones, netbooks, tablets, computers, televisions, bookshelf systems and cars — without the tedium of managing each and every file transfer by hand. And, piece by piece, Google is slowly laying the groundwork to be a player in that space. For private users, inadvertent telegraphing of whether or not your home is empty is one. Last year, Israel Hyman of Arizona believed that his vacation-related Tweets led to his home being burglarized while he was out of town. It’s easy to recommend that users be more circumspect with their location information—for example limiting their followers to a select trusted few, or using direct messaging (DM) for private information. Terms of the acquisition were not disclosed, but a person briefed on the deal said the price for the company, which raised $60 million in capital, was over $100 million. Other companies, including Best Buy, Amazon.com, Comcast and the satellite company EchoStar, had also expressed interest in acquiring Vudu, according to this person, who asked for anonymity because the terms of the deal were private. The two companies began informing Hollywood studios and television manufacturers of the deal on Monday, and Wal-Mart said it was expected to close within a few weeks. The acquisition adds a forceful player to what is already a crowded field of companies aiming to deliver streamed entertainment to the living room. Microsoft Corp. said it reached a patent licensing agreement with Amazon.com Inc. that gives the online retailer rights to use open-source software in its Kindle electronic book reader and servers based on the Linux operating system. Under their agreement, Microsoft said Seattle-based Amazon will pay it an undisclosed sum. Microsoft, Redmond, Wash., said in a statement that the deal was a patent cross-license agreement under which it will also gain rights to Amazon patents that it didn't identify. The survey found that 78 percent of the respondents use the Internet, including 6 percent who don’t have a connection at home but get access at work or somewhere else, and 74 percent have Internet access at home, including 6 percent who use a dial-up connection. ■Americans, on average, pay nearly $41 a month for broadband, and 70 percent of users pay for broadband as part of a bundle of telecommunications services. ■Among those who do not subscribe to broadband because it is too expensive, more than half said they would be willing to pay an average of $25 a month. The purchase gives Wal-Mart, based in Bentonville, Ark., a method of reaching consumers who want entertainment without having to leave their homes. Vudu has a library of about 16,000 movies, many of which can be streamed for instant viewing, according to the statement. The company’s software is installed in a number of televisions and Blu-ray players, and users don’t need a connected computer or cable-satellite service to use it. Vudu, a privately held company with 50 employees based in Santa Clara, Calif., helps consumers stream movies to high-definition televisions and Blu-ray disc players, its website states. Google knows more about you than the NSA, and has recently shown that it doesn't give a hoot about your privacy. The company has gotten too big, and has turned into just another corporation trying to maximize its assets -- and those assets are you. Who's to say Google won't progressively loosen its privacy controls and monetize more and more personal information? I'm ditching Google as much as I can, and when a competitor develops a search engine as good as Google, I'll stop searching with Google, too. The trend that Google has been following has been looking darker and darker as the company nibbles away at the limits of privacy. This is no longer a company I trust. Beyond the immediate forensic inquiry, the work of US researchers sheds light on how cyber-operations are conducted in China. The man who wrote code to take advantage of the browser flaw is not a full-time government worker, did not launch the attack, and in fact would prefer not be used in such offensive efforts, according to the US team that discovered his role. Nathan Myhrvold wants to shake up the marketplace for ideas. His mission and the activities of the Bellevue company he heads, Intellectual Ventures, a secretive $5 billion investment firm that has scooped up 30,000 patents, inspire admiration and angst. Admirers of Myhrvold, the scientist who led Microsoft's technology development in the 1990s, see an innovator seeking to elevate the economic role and financial rewards for inventors whose patented ideas are often used without compensation by big technology companies. His detractors see a cynical operator deploying his bulging patent trove as a powerful bargaining chip, along with the implied threat of costly litigation, to prod high-tech companies to pay him lucrative fees. They call his company "Intellectual Vultures." Professors will be able to reorganize or delete chapters; upload course syllabuses, notes, videos, pictures and graphs; and perhaps most notably, rewrite or delete individual paragraphs, equations or illustrations. A storm of protest hit Google last week over Buzz, its new social networking service, because of user concerns about the inadvertent exposure of their data. Internet users in Iran, however, were spared such trouble. It's not because Google took extra care in protecting their identities—they didn't—but because the Iranian authorities decided to ban Gmail, Google's popular email service, and replace it with a national email system that would be run by the government. Though Gutenberg's invention made possible our modern world with all its wonders and woes, no one, much less Gutenberg himself, could have foreseen that his press would have this effect. And no one today can foresee except in broad and sketchy outline the far greater impact that digitization will have on our own future. With the earth trembling beneath them, it is no wonder that publishers with one foot in the crumbling past and the other seeking solid ground in an uncertain future hesitate to seize the opportunity that digitization offers them to restore, expand, and promote their backlists to a decentralized, worldwide marketplace. New technologies, however, do not await permission. They are, to use Schumpeter's overused term, disruptive, as nonnegotiable as earthquakes. The district's Web site said 42 activations of the system resulted in the recovery of 18 computers. McGinley said the district had hired former Henry Hockeimer Jr., a former federal prosecutor, to review past practices and suggest improvements. The FBI is looking into whether federal wiretap or computer-intrusion laws were violated, according to an official who spoke on condition of anonymity. Tufts University this year has become the first selective college in the nation to encourage applicants to submit videos about themselves. 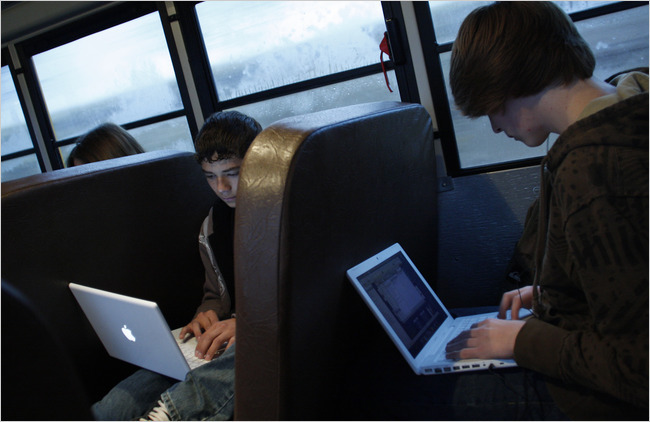 More than 1,000 high school seniors have included one-minute video essays in their bids for a spot in the Class of 2014. And in a strange melding of the once-private college applications process with the openness of the Internet, the videos, posted to YouTube, have generated a surprise following among Tufts students and alumni, who are posting comments campaigning for their favorites. Isn’t that capability bundled with modern webcam-equipped Macs? I’ve read about other people recovering lost Macs by remote-controlling the camera. The flap over Lower Merion, Pa., school officials allegedly spying on students through Webcams on school-supplied MacBooks raises an interesting and important question: Just what expectation of privacy do students have when using school-owned computers? The likeliest answer is not much. Using cameras to observe students unawares is definitely unethical and probably illegal, though we may have to wait for a court to decide that. School officials say that the capability, now disabled, was only used to track lost or stolen laptops.Taking their claim at face value, there’s still a huge difference between what is permitted and what is possible, and the students using these computers need to be aware of both. Google and other Internet destinations aren't making us stupid: They're making us smarter, according to a vast majority of 895 experts surveyed by the Pew Research Center's Internet & American Life Project and the Imagining the Internet Center at Elon University. "Three out of four experts said our use of the Internet enhances and augments human intelligence, and two-thirds said use of the Internet has improved reading, writing and rendering of knowledge," study co-author Janna Anderson said in a statement released today. "There are still many people, however, who are critics of the impact of Google, Wikipedia and other online tools," said Anderson, director of the Imagining the Internet Center at North Carolina's Elon University. NewsGator, the company making SharePoint social, today released two new important Enterprise 2.0 tools: SharePoint’s first native social iPhone client and social computing’s most sophisticated microblogging suite. The iPhone client, and a companion client for the soon-to-be-released iPad, provide on-the-road users with direct access to their enterprise social computing environments without the need for a browser, an extra layer of software that can complicate a work session. As a mobile client for NewsGator Social Sites, the social computing environment most deeply integrated into the SharePoint collaboration platform, the iPhone client accesses all the relevant updates from the user’s colleagues and communities. Mobile phone owners will soon be able to watch live BBC news reports and World Cup football, listen to radio and catch up on iPlayer shows thanks to a fresh set of BBC phone applications. BBC news and sport apps will first be available for the iPhone, with more later in the year for Blackberry, Android and Nokia devices. All the apps will be available free of charge to licence-fee payers, with advertising for smartphone owners abroad. More people globally view BBC content on mobile phones than online by PCs. Apple CEO Steve Jobs has reportedly continued his campaign against Adobe's Flash video technology, this time at a meeting with The Wall Street Journal, according to a report in Valleywag. Microsoft (Nasdaq “MSFT”) and Yahoo! (Nasdaq “YHOO”) announced today that they have received clearance for their search agreement, without restrictions, from both the U.S. Department of Justice and the European Commission, and will now turn their attention to beginning the process of implementing the deal. Google worked furiously over the weekend; in several waves of updates, it fixed the privacy holes and wrote apologetic blog posts. Now when you sign up, Google merely suggests people you might want to follow; you have to approve or reject the suggestions. It’s also much easier to turn off Buzz completely with one click. So now, Buzz isn’t nearly as much of a privacy concern. But don’t worry — it’s still got plenty of problems to go around. What is more surprising? The fact that Google claims it was taken aback by the negative reaction to its Buzz feature, the one that ventured to make public your most frequent e-mail contacts? Or the fact that a couple of law firms have got together to present Google with a class action lawsuit? According to the San Francisco Chronicle, law firms in San Francisco and Washington, D.C. have filed a suit on behalf of Eva Hibnick. Hibnick is a Florida woman who has been chosen to represent the many Gmail users who felt, well, used, when Google launched Buzz. But according to at least three people with knowledge of the discussions, who spoke anonymously because of the confidentiality of the talks, Apple inserted provisions requiring publishers to discount e-book prices on best sellers — so that $12.99-to-$14.99 range was merely a ceiling; prices for some titles could be lower, even as low as Amazon’s $9.99. Essentially, Apple wants the flexibility to offer lower prices for the hottest books, those on one of the New York Times best-seller lists, which are heavily discounted in bookstores and on rival retail sites. So, for example, a book that started at $14.99 would drop to $12.99 or less once it hit the best-seller lists. Moreover, for books where publishers offer comparable hardcover editions at a price below the typical $26, Apple wanted e-book prices to reflect the cheaper hardcover prices. These books might be priced much lower than $12.99, even if they did not hit the best-seller list. Judge Denny Chin has given 28 parties five minutes each to speak. Twenty-three of those–including Microsoft, Amazon.com, AT&T and the French Republic–are scheduled to speak in opposition. The objectors are a diverse crew, including privacy watchdogs, corporate giants and lawyers speaking on behalf of Arlo Guthrie, science fiction writers and the State of Connecticut. Five, including Sony Electronics Inc. and the Center of Democracy & Technology, are expected to voice their support. After that, Judge Chin is expected to hand the microphone to the Justice Department, which has encouraged the court not to approve the deal. The Department told the court earlier this month that even after some revisions, the settlement takes too much liberty with the class-action mechanism and could stifle competition. Representatives for Google, the Authors Guild and the Association of American Publishers will wrap up the scheduled remarks. Even as it rebrands and upgrades its broadband products, Comcast Corp. is rolling out a new product that will allow subscribers to back up and share all of their data - pictures, files, video - on the Internet. Comcast Secure Backup & Share will be powered by Mozy, a subsidiary of EMC Corp., the giant data storage company headquartered in Hopkinton. It will allow Comcast’s 16 million broadband customers to store their most precious data automatically on remote servers, as a defense against computer breakdowns or theft. Microsoft Corp. President Stephen Elop is preparing for the biggest shakeup to the $19 billion Office business in a decade as the company races Google Inc. to sell Internet-based programs. Two years into his career as head of Microsoft’s business software unit, Elop says cloud computing and social-networking sites have created a “constructive disruption” that could be more of an opportunity than a threat. Office 2010, due by June, will include a free Web-based version for the first time, matching similar software from Google. Future updates may add Twitter-like functions that allow users to post short messages. See the full article for details. I think this general pattern (in the immediate-term, the incumbent players have more to lose than Google has to gain) is evident in several markets in which Google is investing. I also think the wireless “stupid network” is a market inevitability, however. Good luck to Eric Schmidt in trying to reassure the Telcos that Google is their friend and partner. Just look at the list above. It seems as if Google has not considered the strategic implications of its actions on wireless operators, and its other partners. Nearly all of its actions in the list above do nothing to increase revenues for Google. They are all outside of its core business: selling advertising related to search. Yet those actions have put the wireless operators on guard. They can now take steps that can impact Google's revenues much sooner than Google's actions can improve revenues for Google. This is a strategic blunder on Google's part because the wireless operators are in a much stronger position than Google. The average U.S. Internet user spends more time on Facebook than on Google, Yahoo, YouTube, Microsoft, Wikipedia, and Amazon combined. Think about that for a moment. […]Back in June 2009, Nielsen estimated that the average U.S. user spent 4 hours and 39 minutes on Facebook per month. That’s about 9.3 minutes per day in a 30 day month. In August, that number rose to 5 hours and 46 minutes, or 11.5 minutes per day. In January 2010 though, the amount of time the average person spent on Facebook jumped to over 7 hours. Each American Facebook user spent an average of 421 minutes on Facebook per month, which amounts to over 14 minutes per day. Even if you lump together the time spent on Google( ) (1:23), Yahoo (2:09), YouTube( ) (1:02), Microsoft/Bing( ) (1:35) Wikipedia( ) (0:15), and Amazon (0:22), it still doesn’t beat Facebook. The donation’s definitely in line with Google’s generosity to foundations that promote a faster and more open web. However, we think it’s interesting that Google is giving money to the Wikimedia Foundation now, only a year and a half after the search giant launched its own Wikipedia killer, Google Knol. Back then, we said it was doomed to fail, and so far Knol’s stagnation has proven us right. Is this a sign that Google’s abandoned the project and is embracing Wikipedia as the web’s center for knowledge? Hopefully we’ll get some answers tomorrow. Social media has already been a minefield for Google, with stops and starts amid charges that the engineers who built Google don't understand the wider world of social networking. Fairly or unfairly, incidents such as the Google Buzz launch underscore that Google employees--among the smartest and most tech-savvy group of workers in Silicon Valley--may not be the best testing ground for products designed to reach the general public. Google Buzz (google.com/buzz) is built into Gmail, Google’s email program, as an opt-in social network that provides people with a place for sharing status updates, Twitter tweets, photos, videos, Web links and blog posts with a network of friends. I’ve been testing Google Buzz, and I like the way it displays shared photos in full-screen view and nestles into Gmail, which I use every day. But right now, Buzz still falls flat. Google Buzz got off to a rough start and still has a lot of catching up to do. Though it could be a convenience for people whose social contacts all already exist in Gmail, it could also saddle them—and their friends—with yet another social network to check every day. For now, my social-networking friends are sticking to Facebook and Twitter, making the buzz on Buzz almost inaudible. [...] Mr. Ellison spent a reported $400 million on the effort, a figure he calls "a little high." "Absolutely, it was worth it," he says of the victory, which brings the trophy into U.S. hands for the first time since 1995. "It's been a very exciting journey, this 10-year journey as we've advanced the technology. I've gotten to sail with, today, the best sailing team in the world, and I'm very proud of that. Absolutely, I'd do it again." Verizon Wireless, the largest US mobile-phone carrier, will include Skype Technologies SA’s calling service on handsets such as the BlackBerry to fend off competition from AT&T Inc. The service will work on Verizon’s third-generation network, on phones including Motorola Inc.’s Droid and Research in Motion Ltd.’s BlackBerry Storm, Verizon and Skype said yesterday. Customers need a data plan to use the service. With the proliferation of blogs, vendor attack ads, IT pundits, social media, etc. the amount information (and sometimes misinformation), can be overwhelming. We know many of you want to compare how we differ from some alternative approaches and that’s normal. You wouldn’t believe how many times I’ve been asked to offer my opinion on a competitor’s product. I am very proud of the software we build and let the solutions speak for themselves. When asked all I can do is provide as much factual evidence and insight about why our approach differs and how those differences map to a customer’s needs. Today's we've made some materials available on our existing web properties. For ease of navigation, you can go to www.whymicrosoft.com. The contact-centric approach taken by Microsoft enables you to quickly and easily view all content associated with a given user--including their recent Twitter tweets, Facebook status updates, or other social networking interactions--without overwhelming the Outlook inbox or dumping an avalanche of irrelevant communications on you. We're still a few months away from the official launch of Office 2010, and there are no social connectors available just yet. But, Microsoft's approach seems much more efficient, and more promising for business professionals, especially for business users that already rely on Microsoft Outlook for e-mail, or who are interested in integrating social networks beyond Twitter. Ownership of subscriber information and pricing have emerged as key issues. Apple’s practice of sharing with its partners little consumer data beyond sales volume is a problem. “Is it a dealbreaker? It’s pretty damn close,” said one senior media executive of a US metropolitan daily newspaper. A South Florida teenager who sued her former principal after she was suspended for creating a Facebook page criticizing a teacher can proceed with her lawsuit, a federal judge has ruled. The student, Katherine Evans, is seeking to have her suspension expunged from her disciplinary record. School officials suspended her for three days, saying she had been “cyberbullying” the teacher, Sarah Phelps. Ms. Evans is also seeking a “nominal fee” for what she argues was a violation of her First Amendment rights, her lawyers said, and payment of her legal fees. Now Apple's chief executive is set to collaborate on an authorized biography, to be written by Walter Isaacson, the former managing editor of Time magazine, according to two people briefed on the project. The book, which is in the early planning stages, would cover the entire life of Jobs, from his youth in the area now known as Silicon Valley through his years at Apple, these people said. Jobs, who will turn 55 on February 24, has invited Isaacson to tour his childhood home, one person with knowledge of the discussion said. Forget everything you know about Windows Mobile. Seriously, throw the whole OS concept in a garbage bin or incinerator or something. Microsoft has done what would have been unthinkable for the company just a few years ago: started from scratch. At least, that's how things look (and feel) with Windows Phone 7 Series. This really is a completely new OS -- and not just Microsoft's new OS, it's a new smartphone OS, like webOS new, like iPhone OS new. Marc Rotenberg, executive director of the Electronic Privacy Information Center, said his organisation still intended to file a complaint with the Federal Trade Commission this week pending its review of Google's changes. "Even with these changes, there is still the concern that Gmail users are being driven into a social networking service that they didn't sign up for," Mr. Rotenberg said in an interview with the New York Times. Given how much information Google already has about its users, and given the scrutiny the company is increasingly coming under from federal regulators, Google needs to go that extra mile when it comes to privacy and to be ahead of the curve when it launches new products and features. Yet Google, so far, has only said they're sorry for the "concern" they've caused. That shows that they're not owning up to the breach they caused. They can't possibly be so stupid as to not understand what they revealed about users of Gmail. It's just the kind of weaselly response to a building crisis that PR pros tell you not to do, that covering up will only make it worse when people realize what's really been going on. But that assumes a competent and vigilant press. That would be too much to assume in the case of Google and its coverage. The Don't Be Evil smokescreen was pure brilliance. As Michael Gartenberg said on Twitter, if Microsoft had done what Google did, there would already be lawsuits. It would be a scandal of huge proportion. It’s been 4 or 5 days now, and even though Google PR has earned its keep managing the privacy missteps, we haven’t heard apologies from the CEO or founders like Zuckerberg pumped out around Beacon and whatever the next stumble was. What’s weird is I can’t remember much more than some Terms of Service that had to be rolled back. It may seem unfair, but Google has waited long enough to benefit from user fatigue about any of these issues. VALENCIA, Spain - Still bundled against the cold in his white foul-weather gear, software tycoon Larry Ellison hoisted the America’s Cup high, then planted a kiss on the oldest trophy in international sports. “Valencia - muchas gracias!’’ the self-made billionaire screamed, following the ride of his life across the Mediterranean on one of the most remarkable boats ever built. Looking for a bit of light reading this weekend? Then look no further than the 400+ pages of the Economic Report of the President (the hotly anticipated sequel to the Economic Report of the President) which, for the first time, has been made available as a free e-book. That includes versions ready to be delivered to your Kindle or Nook (the former of which is already sitting at #46 on the bestseller list), and an ePub version for Sony readers and other devices. This book is very much like the Jaron Lanier he shows in his public appearances: mind-bending, exuberant, brilliant, thinking in all directions. He describes how computer software locks us into rigid ways of thinking (which brings up the next logical question, though he fails to ask it: How can a computer, with its need for standard interfaces, not lock us into the behavior and thought patterns implicit in our software?). He discusses how pack-like attacks arise on the Web wherever there is an opportunity for "consequence-free, transient anonymity." The topic hardly matters: "Jihadi chat looks just like poodle chat." He describes the sad, stressful lives of young people who "must manage their online reputations constantly." He makes the point that the free use of everything on the Web leads to endless mashups, except for the one thing legally protected from being mashed-up: ads, making advertising the one thing on the Internet that can be "owned." In the book's final pages, he tries to imagine an alternative to "totalist" computing: a new sort of virtual-reality software that would allow us to express ourselves through transformations of our virtual bodies, as if we were cephalopods. All of which sounds quite wild, but so did virtual reality in 1980. Late Saturday, Todd Jackson, product manager for Gmail and Google Buzz, wrote in a blog post that Google had decided to alter one of the most vehemently criticized features in Buzz: the ready-made circle of friends that Buzz gives new users based on their most frequent e-mail and chat contacts. Now, instead of automatically connecting people, Buzz merely suggests to new users a group of people that they may want to follow or want to be followed by. Finally, Google is creating a new Buzz tab in Gmail’s settings page that allows users to hide Buzz from Gmail completely. The page gives users the option to disable Buzz, deleting their posts and, importantly, removing their Google profile, which in many cases listed publicly a user’s circle of contacts in Buzz. So, you have all these killer photos of different cities around the world just sitting on some hard drive or server and the best you can do with them is send them to friends as is, right? Isn’t it funny that the photos you tend to zip through are the ones with no people in them, but when you were there man it was a cool shot that you just HAD to capture? Well, we’re giving those photos some love (and context) with our latest mash-in to the Bing Maps Application Gallery. We’ve just rolled out a new application that is currently in a tech preview phase that pulls photos from Flickr®, associates them with Bing Maps Streetside photos and then overlays them by stretching the photo to form fit where in the world it belongs. The new application called Streetside Photos is currently available in Seattle, San Francisco and Vancouver (Canada) - (hello, Olympics!!) to view your Flickr photos in a whole new way. Check out the Bing Search post, Spatial Search: The New Frontier for a full read on how we're changing how we think of search. Check the full post for more resources (via Richard Eckel). In November 2009, when Microsoft announced the release of the public beta of Microsoft Office 2010, the company also introduced an entirely new add-on for its Outlook product that we haven’t heard a peep about since. That’s about to change soon. The product, dubbed Outlook Social Connector, essentially aims to make Outlook more social by integrating streams from Windows Live and third-party networks directly into the widely used communication app and its familiar interface, among other features that will enhance the functionality of Outlook and other Microsoft products like SharePoint. The Official Microsoft Blog – News and Perspectives from Microsoft : Can’t Make it to the Vancouver Games? Microsoft has you Covered. See the full post for additional resources. On the Web in High-Def: MSN has teamed up with NBC Universal to help create NBCOlympics.com on MSN, a great online experience for fans across the United States. Thanks to Microsoft’s Silverlight technology sports fans can follow the events in 720p high-definition, smooth -streaming video. More than 400 hours of live competition and more than 1000 hours of full-event replays will be available. Just like a DVR, viewers can rewind, fast-forward and even pause the action. In 2008 for Beijing, the NBC- Microsoft Silverlight partnership yielded not only a brand new way to cover a sporting event on the web, but also a record number of viewers: 52.1 million people logged on to watch 9.9 million hours of video. What more do you need to know: Need event schedules? Want to know more about your favorite athlete? Need to understand the rules? MSN and Bing can help. NBCOlympics.com on MSN not only has rich Silverlight enabled video but will also feature medal trackers, HD photo galleries and an “Inside this Sport Section” so that you too can understand even the most obscure event. In light testing yesterday I found Buzz to be immediately familiar, as it works much like Twitter or Facebook. But I suspect that many people will have the same reaction I did, which is one of social networking fatigue. Enough already: Even the shameless self-promoters who live via their Twitter feeds must get tired of talking about themselves at some point. Both Microsoft and Yahoo! have ridiculed Buzz, noting that their own (separate but similar) approaches make more sense for customers. "Busy people don't want another social network," Microsoft said via a prepared statement. "They want the convenience of aggregation. We've done that. Hotmail customers have benefited from Microsoft working with Flickr, Facebook, Twitter, and 75 other partners since 2008." 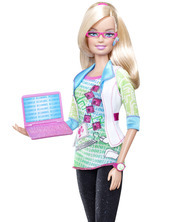 Barbie, whose various careers have taken her from aerobics instructor to supermodel to business executive, will next be a computer engineer, a career chosen by half a million Barbie fans. She also wears a neon-colored T-shirt with a binary code pattern and carries a smartphone and a Bluetooth headset. Her hot pink glasses will come in handy during late nights coding on her hot pink laptop. Before any one begins complaining, Mattel points out that her accessories were chosen with the help of the Society of Women Engineers and the National Academy of Engineering. Every day in Britain millions of searches are carried out on Google for free. Every month we spend millions of hours on Facebook for free and read millions of articles from free newspapers. But now look at it the other way round. Google sought on Thursday night to quell an outcry over the privacy settings in its new Buzz social networking service, which critics have claimed exposes personal information about users without their approval. The internet company acknowledged the concerns raised by the service, launched just two days before, and announced changes designed to stem the fears, though these did not directly address all the complaints from some critics. Its change of heart follows a growing chorus of complaints on the web. One privacy advocacy group told the Financial Times that it planned to file an official complaint with US regulators over the affair. When we use the Web today we treat the most fundamental scenarios as separate activities. Search takes us from many things to one, browsing moves us from one thing to another, and recommendations expose affinities that enable us to explore related topics. Can we do better by combining these scenarios into a more unified experience? Pivot focuses on this intersection, enabling us to learn key lessons while attempting to broadly apply this philosophy to the Web. We hope that Pivot will inspire and fuel transformative experiences across the Web. At the heart of Pivot are "Collections." They combine large groups of similar items on the Internet, so we can begin viewing the relationships between individual pieces of information in a new way. By visualizing hidden patterns, Pivot enables users to discover new insights while interacting with thousands of things at once. The price of the deal was not disclosed, but TechCrunch, citing an anonymous source, said Google paid around $50 million for the company. Late last year, the company, which has raised more than $6 million in venture capital, was being shopped to Google and others for around $70 million, two people with knowledge of the offer said. Google once operated a paid question-and-answer service called Google Answers, which it shuttered in 2006 after it failed to get traction. Its rival Yahoo runs Yahoo Answers, a popular service where people can seek answers to their questions.